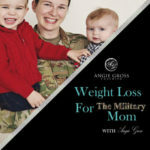 Welcome to the 14th episode Weight Loss For The Military Moms Podcast. This episode is all about anxious eating. Has a situation ever occurred that spins you into a cycle of anxiety and leads to overeating. Well that is exactly what happened to me. Listen to this weeks episode to find out more.